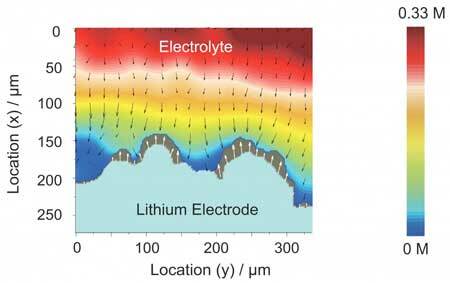 (Nanowerk News) Lithium metal batteries hold tremendous promise for next-generation energy storage because the lithium metal negative electrode has 10 times more theoretical specific capacity than the graphite electrode used in commercial Li-ion batteries. It also has the most negative electrode potential among materials for lithium batteries, making it a perfect negative electrode. However, lithium is one of the most difficult materials to manipulate, due to its internal dendrite growth mechanism. This highly complex process is still not fully understood and can cause Li-ion batteries to occasionally short circuit, catch fire, or even explode. Columbia University researchers announced today that they have used Stimulated Raman Scattering (SRS) microscopy, a technique widely used in biomedical studies, to explore the mechanism behind dendrite growth in lithium batteries and, in so doing, have become the first team of material scientists to directly observe ion transport in electrolytes. They discovered a lithium deposition process that corresponds to three stages: no depletion, a partial depletion (a previously unknown stage), and full depletion of lithium ions. They also found a feedback mechanism between lithium dendrite growth and heterogeneity of local ionic concentration that can be suppressed by artificial solid electrolyte interphase in the second and third stages. 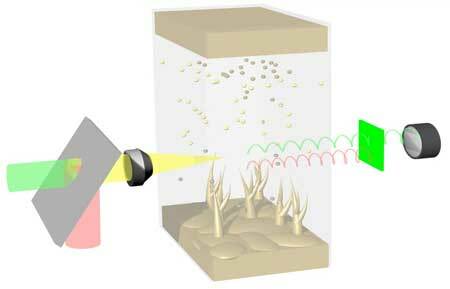 The paper is published online in Nature Communications ("Operando and three-dimensional visualization of anion depletion and lithium growth by stimulated Raman scattering microscopy").